This section contains information related to Smartwings, flight code QS, a low-cost carrier charter type. 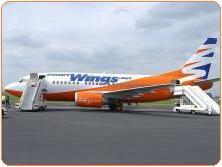 "Smart Wings is a brand for low-cost scheduled flights of Travel Service Airlines. Travel Service is the largest private airline company in the Czech Republic and at the same time, one of the most dynamically expanding charter carriers in Central Europe. Travel Service was established in 1996 on the cornerstones of the Governmental Air Transport Office of the Czech Republic. More than 1.7 million passengers used our services last year, not only in the Czech Republic but also in Hungary and Spain where they have subsidiaries." Smartwings is a fully owned subsidiary of 'Travel Servis Airlines', a privatly owned company. Click to browse to the network development section of this site, featuring more more information on the network development of Smartwings.